Beyond blue belt, Gracie Jiu-Jitsu® consists of hundreds of advanced techniques, all of which have been organized into a clearly defined, systematic curriculum called the Master Cycle®. The Master Cycle is broken down into three levels: purple belt, brown belt, and black belt. Advancement within each belt level requires successful completion of four stripe courses, each of which features 50-60 lessons which are divided into seven positional chapters. On this DVD, Ryron and Rener explain the entire Blue Belt Stripe 1 testing process and they demonstrate all 160 techniques that must be perfected for promotion consideration. Master Cycle: Blue Belt Stripe 1 - Official Test has been added successfully to your wishlist. The Blue Belt Stripe 1 Official Test consists of six drills, three Technical Drills, and three full-resistance Sparring Drills. On this DVD, Ryron and Rener Gracie discuss the parameters of each drill as well as demonstrate all 160 techniques in the exact order that will be expected of you. The brothers also explain the grading criteria that will be used to grade your performance. When confident in your ability to perform all six drills, you can test for Stripe 1 promotion via Live Evaluation or via the Video Evaluation Process. For more information on these testing methods, and to download the official list of techniques, please visit the online 'Testing Center' at www.GracieUniversity.com. When you pass the test, Gracie University Headquarters will send you your stripe and an official promotion certificate in the mail. Once you earn all four stripes on your blue belt, you qualify to test for purple at any Level 4 Certified Training Center under the watchful eye of a Gracie Jiu-Jitsu Black Belt Instructor. 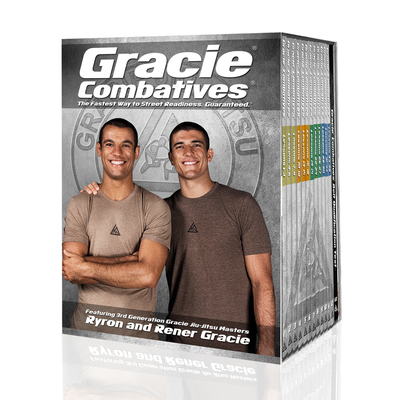 As a special bonus on this DVD only, you will get to watch Ryron and Rener Gracie go at it in a 25-minute fully resistant sparring session! To ensure that you get the most out of this dynamic grappling match, the entire session has been fully narrated - by both brothers individually - and you get to choose which one you listen to while you watch! 1. Is this an instructional DVD? Can I learn all the Blue Belt Stripe 1 techniques from this DVD? No, this is not an instructional DVD. Even though most of the Blue Belt Stripe 1 techniques are demonstrated on this DVD there are several variations that were not included in the test. During the test demo, the brothers quickly present the techniques to demonstrate the test sequence; they do not present sufficient detail to learn the techniques. In fact, they do not speak at all during the demonstration. To avoid learning the techniques incorrectly, and to ensure the development of reliable reflexes, please watch all the comprehensive Blue Belt Stripe 1 instructional lessons featured in the Curriculum section at www.GracieUniversity.com. 2. Can I test for Blue Belt Stripe 1 if I am an "unverified" blue belt? No. Due to the linear nature of the Gracie University curriculum, in order to test for Stripe 1 promotion, one must first have their blue belt "verified" by completing the Gracie Combatives course - either at a Certified Training Center, on DVD, or online through Gracie University. Since Gracie Combatives is the core of the entire Gracie Jiu-Jitsu curriculum, earning a stripe on your blue belt is meaningless if you haven't first perfected the Gracie Combatives techniques since the street applicability of your techniques will be questionable. 3. Will the Blue Belt Stripe 1 test also be available on Gracie University? Yes, the test demonstration will also be available online through Gracie University in the future. But, the bonus sparring session between Ryron and Rener will only be available on the DVD. Furthermore, the online version of the test will be lower quality video and can only be viewed where there is an active internet connection. With the DVD version, you can prepare for the test more effectively, since you can watch the test in a room, Gracie Garage, and training center where there may not be an active internet connection. This DVD is region free (NTSC) and is formatted to play on all DVD players. Hey Guys! Just received the Blue Belt Stripe 1 Test DVD. WOW! It is amazing. I wanted to thank you for all of the hard work and everything you do. Everything is 150% with you guys! If I wasn't already fired up training, now I'm burning! Thanks for including the "Brotherly Battle" full-on sparring session between you two (Ryron and Rener) and for taking to narrate it. I can honestly tell you that I have never, ever seen that level of technique and flow, ever. The word "Amazing" really does not do it justice! Thanks again. All my Respect to you and your family. Just received the BBS1 Test DVD. Fan-freakin'-tastic. With only the Brotherly Battle it would have been worth every penny even if it didn't include the test videos. Thanks for sharing the rolling session and your verbal breakdowns with us. For other readers, definitely, buy the DVD if you're on the fence about it. Two thumbs up from TLC Gracie Garage. Just finished watching the BB Stripe 1 DVD, simply amazing jiu-jitsu instruction. The brotherly roll was intense, to say the least. Thank-you for demonstrating how it is done for real. Gracie University Headquarters recently released their Blue Belt Stripe 1 Official Test DVD, and I wanted to give some feedback on it. completed the Gracie Combatives white-to-blue curriculum, and was very curious to see how the Gracie family would create a test for their Stripe 1 curriculum with such a large amount of information. (Stripe 1 alone has approximately 160 technical variations and over 52 hours of video instruction!) The biggest difference in the technical demonstrations of the stripe 1 test versus the Gracie Combatives (aside from the number of techniques) is that the demonstrations are done with much more conviction, intensity, and crispness. It is hard to watch the drills and not want to train on the spot, and the DVD drills served as a quick reminder to me that I have a long way to go before I am Stripe 1 material. In particular, I easily foresee "Drill 3" requiring the most practice outside of regular class because it includes Chapter 6 in the Master Cycle (foot locks, toe hold foot locks, knee locks, heel hooks, and their counters) which are rarely practiced, and even forbidden at many schools. Whether you are planning to test for a stripe or not, however, the highlight of this DVD is the "brotherly battle" section, in which Ryron and Rener spar competitively for 25 minutes. This is not a cooperative slow roll demo, and I will not even try to explain what goes on because I will not do it justice. People often say that jiu-jitsu is like kinetic chess, so I suppose the Gracie brothers sparring match is comparable watching two chess masters play kinetic "speed chess". Even if you're too new to the art to understand what is going on, you will still appreciate watching two black belts who know all of the other person's moves, counters, and re-counters spar competitively for that long. As a bonus, there is a feature that allows you to select whether you want to hear Ryron or Rener narrate the sparring session. Both brothers explain what they are looking for in their attacks, how and when they defend and escape various positions, and also share in detail their grandfather's philosophies and sparring mentality, in particular how they are able to spar against an uncooperative opponent for so long. In closing, if you are preparing for Stripe 1 testing, or you want a quick overview of the specific techniques that Ryron and Rener teach at the beginning of the blue to purple belt journey, then this DVD is for you. Or, if you just want to see the Gracie brothers trying to kill each other in a sparring match, then this DVD is for you too. There are currently no reviews for Master Cycle: Blue Belt Stripe 1 - Official Test, but you can be the first!